And now by popular demand also running RATIO-FREE till Jan 2015 on ZOMB!!! Original video sources rendered with Vegas 12.0 Sony AVC Codec > MP4 @ 25 Mbps (1920x1080 59.97 fps), audio source rendered @ 384kbps AAC. My first video editing contribution to the community, and it has been a great learning experience. It has been a pleasure to work with such high quality audio and video. I must thank inez for keeping me on my toes and pushing to get the best out of this project. I sincerely hope you enjoy it! A big thanks to joebreslin for the amazing Radiohub! Would also like to say thanks to everyone who I have ever met through the AustinBrock YouTube channel. I wouldn't have been here editing this show if it wasn't for your love and support from the beginning. Thank you. THANK YOU Thom, Flea, Nigel, Mauro and Joey!!! - this was a great gig and a ton of fun! Many many thanks go to our tapers! Booboo, who flew in from TX and handled the audio rig from the seats, all six video tapers (joe, carol, godieinhell2, Matt, Tom and yours truly) who donated their raw footage for this project and of course Austin for editing and re-editing and re-editing - and being super-responsive to my endless requests to cut a few seconds here and overlay there and zoom some place else and what not - so that in the end, 3 months later, we get the best document of this awesome show for all of you guys to enjoy. It took a long time and a lot of work - but here's the multi-cam show of the second Roseland gig last Fall. 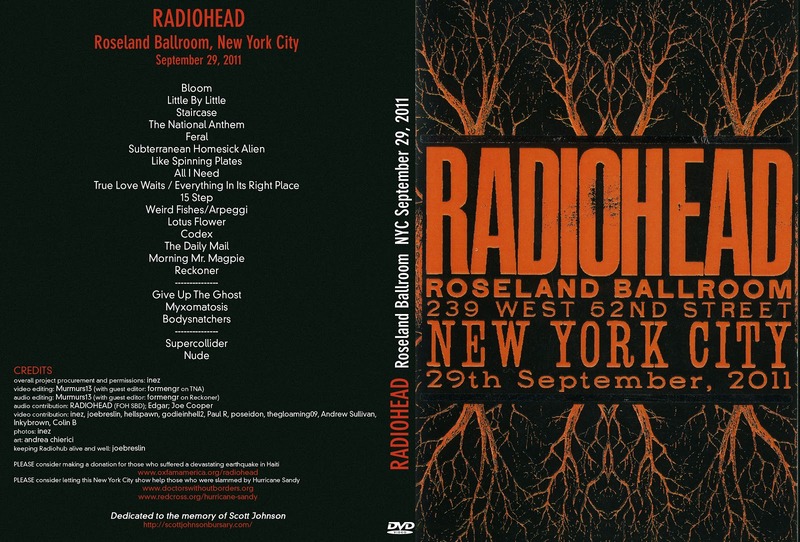 Our enormous thanks go to Radiohead for playing the pre-TKOL-tour shows and for choosing Roseland :)! And we are immensely grateful to the band for generously providing the SBD audio for this project!! Thank you, Chris, for making things happen! Of course, the project would have never happened without our dear video and audio contributors - thank you, guys! As you are enjoying this show, we request that you consider making the world a better place and help out folks who have been deprived of most things that we have and are having a really hard time getting their lives on track. Remember, this is a New York City show. And as we know, New York and the Tri-State area was just struck by a disaster of its own. Please consider helping your neighbors! Thanks to all who stood quiet and still during the concert in order to tape and film it, and and then to share with us. Thanks to Radiohead for providing the soundboard recording! All tracks had at least two sources of video to use, which was a bonus. The many different video formats and settings made this a bit of a challenge and that, combined with life, are the reasons that this took so long to complete. Special thanks to joebreslin for keeping the hub together all this time! Thanks to Inez for doing the footwork on this project, and lastly, thanks to form for his contribution (TNA editing and some audio patching) and for being the first person to help me out when I first came across the hub! YOU ROCK! This was the most incredible concert... and if any of the guys from Wordless Music Orchestra are watching it - THANK YOU so much! PLEASE watch in HD - it took me eternity to upload. RADIOHEAD for HAITI multi-cam DVD release!!!!!!!!!!!!!! SO as some (many?) 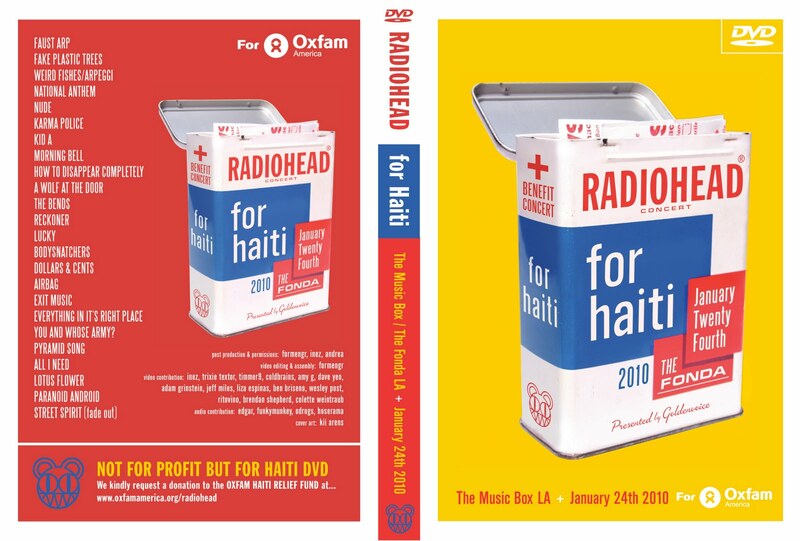 of you know, after the incredible gig Radiohead played last January to raise money for Haiti after that horrible earthquake, there has been a huge effort to create a multicam DVD to… - well, you can never ‘re-create’ this magical performance, especially given that only 1400 people got to attend it, so the recordings are scarce and precious. But one can at least try! So we (formengr, andrea and myself) tried to collect every frame out there to get the best coverage possible… and share it with all of you. But remember - it was a SPECIAL show with a SPECIAL purpose – to raise badly needed funds for those who lived through the devastation. And it seemed only appropriate that the DVD should carry on some of these goals. 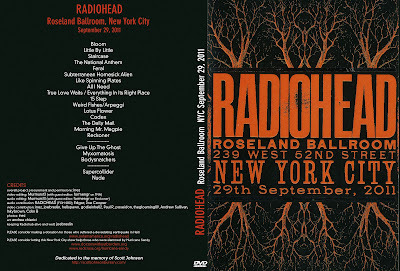 So on the behalf of our little team of three, I contacted the band/management to tell them about our project and asked to name a charity of their choice - so that those downloading the DVD could donate some money to it – however much they can (‘cause we trust Radiohead’s choices don’t we?). We were thrilled to hear that Radiohead supported our efforts :-) and named Haiti to be the ‘beneficiary’ of such donations. They also chose Oxfam – who originally helped to organize the show – as the organization that would handle it. So I asked Oxfam if they could create a DEDICATED LINK for us, Radiohead fans, so in the end, we would know how much we have raised and let the band know too!.... I am quite ecstatic to tell you that it all happened! Finally, Kii Arens – the author of the original ‘bandaid’ poster for the show - stepped forward to create artwork for our DVD! You see it on top of the post but the real hi-rez file is included in the DVD (so don’t rip this blog :)) – thanks, Kii!! In this project, we have recordings from 14 video tapers, 4 audio tapers (everyone is listed in all art and all info files), more audio mixing by hoserama and an astounding amount of editing work by formengr (love you, form!) – I feel like we are all thanking each other, and it feels great! So THANKS again!! as per Oxfam, our DVD has raised $23,690 in a total of 1236 gifts.... from 42 countries!! All of you who donated your footage and/or to raising money for Haiti - THANK YOU!!!!!! Last but not least: both the DVD and the HD mp4 (and MUCH more) are ALWAYS available on Radiohub. You will need a direct connect (dc++) client which is free and easy to use. Happy holidays of all kinds!